lower lovelies this week features this amazing ‘Tulipiere’ from the new ‘Country Estate’ china pattern by Juliska. I love this pattern so much that I designed my Atlanta kitchen remodel around it–lots of grays and creamy whites live here now. The room is so restful that I have been working here for two days now–peaceful and happy. Can a room do that? Back to the flowers–pink tulips of course, dozens of them. Have a wonderful weekend and arrange some tulips for yourself. 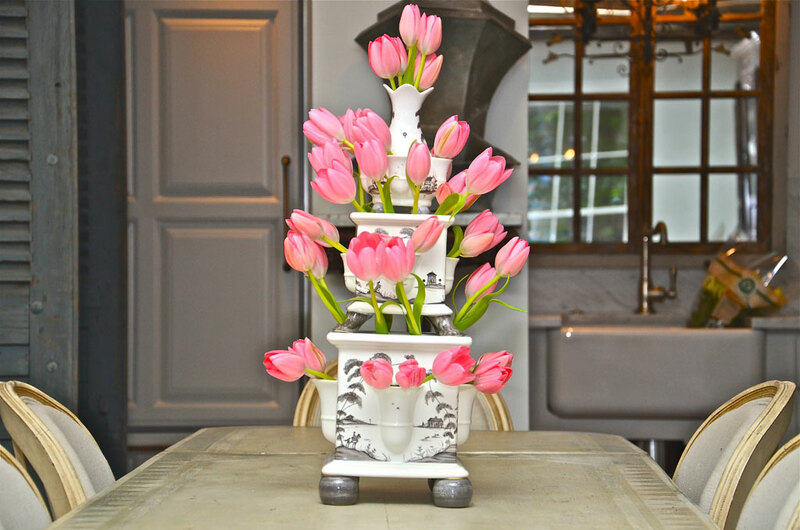 Tulipiere in the Country Estate pattern by Juliska, filled to the brim with Pink Tulips. Thanks Charlotte, and thank you for the flowers! Thanks Deb! I love the kitchen now–may never leave! WE believe in pink! Have a pinkalicious weekend, Lissy! Lissy-Gracious you have been busy ! Looks fabulous & charming!Please get in touch … I have something for u & lots of roses when the tulips are gone! Thank you so much! It has been great fun with a lot of dust! Thanks Holly, I am so excited to finally use this! Love the Tulipiere and beautiful tulips. So glad you love your new kitchen and would love to see it in person! I know it is beautiful because you have good taste! The tulips are still in great shape!